I believe somewhere in a previous life, I was a full fledged Italian. That could be the only explanation to my complete and utter love for Italian food. I am a SLAVE to pasta. Chewy, tender noodles dressed in lovely and silky sauces are what this girl’s dreams are made of. I have spent much of my career working in Italian restaurants. As a result I have spent countless agonizing moments attempting to resist the temptation of my beloved noodles. One would think that serving up the pasta day in and day out would make one sick of it. But no, I never did get sick of it and I considered it a weekly treat when I finally would order up some saucy thang and slurped and chewed until the delicate sauce splattered all over the crisp white table cloths. 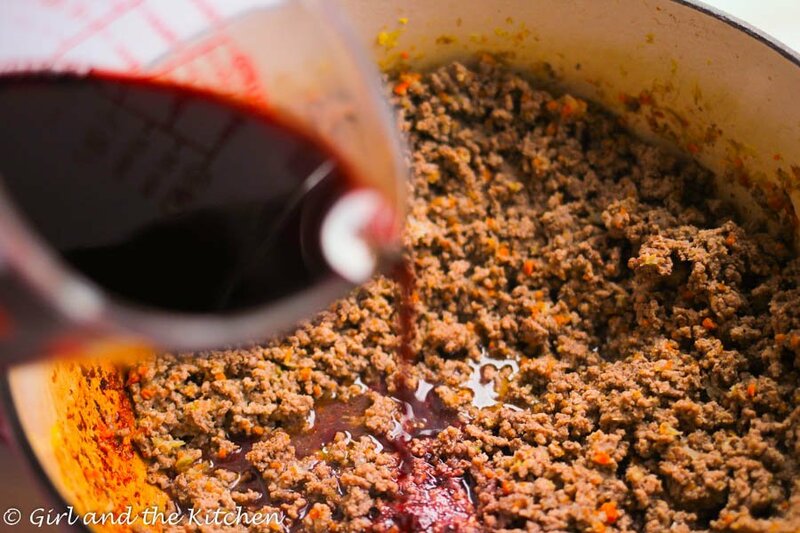 A few months ago, I stumbled upon a fabulous food blog named Pinch and Swirl. I virtually met the owner of this blog, Marissa, through a fantastic group on Facebook, called Food Bloggers Central, run by another incredible blogger and virtual friend, Nagi from RecipeTin Eats. ANYHOW…a few months ago we all decided that we would take one of the bloggers recipes and re-create and blog about them. Naturally, I am late. However, I am late and with purpose! A. do justice to this dish. B. I felt I needed to do a bit more than JUST recreate this dish. So I interviewed Marissa in an attempt to understand her thoughts on food, family and blogging. 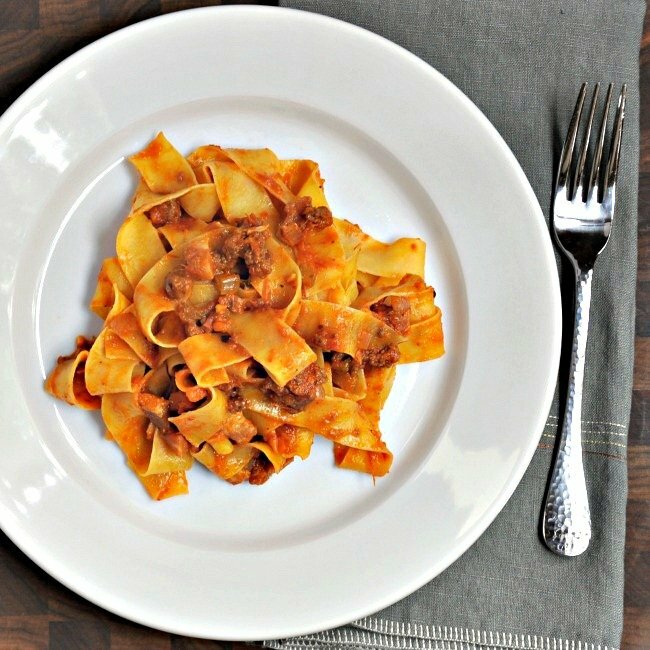 When I saw this Traditional Bolognese Ragu recipe on her page I knew it must be mine. I knew that there was a perfect compartment in my belly for this piece of heaven. 1. Describe your typical day. My husband and I run a digital marketing company – so I fill my days working with clients, graphic designers, writers and doing web development, press outreach, etc. I love what I do for a living, but cooking is my hobby / passion! It’s my outlet and the way that I love to spoil the people in my life who I love. 2. How do you decide what to blog and what inspires you? For years, I’ve had the motto at Pinch and Swirl, “Love People, Cook Them Tasty Food.” I still love that and try to live it. But recently a commenter said that a recipe of mine followed the principle of ‘Fresh food cooked simply’ – and I thought, wow! That’s exactly what I aspire to with this blog. So let’s go with that. Fresh food that’s in season inspires me to get in the kitchen and cook! 3. What is the most important thing you do to grow and enrich your blog? Definitely building relationships with other food bloggers. It’s a wonderful community of men and women who support and inspire each other and I love being a part of that! 4. What is the one thing in your kitchen (food or device) you CANNOT live without? Oh boy, do I have to pick just one!?! Okay, my Global Santoku knife. If my husband would let me, I’d sleep with it under my pillow. 5. What is your favorite type of food to cook and why? Dishes that are loaded with fresh vegetables. A few years ago, I read a book called “What to Eat and Why” by Nina Planck. In it she referred to vegetable serving sizes as a ‘doll’s portion.’ I agree! Thank you so much lovely Marissa for allowing me to peek into your life and for allowing me to make such a fantastic recipe that I have been happily slurping for days after and now a few weeks in I still have a good deal of the sauce still sitting in my fridge just waiting for more noodles! 1. 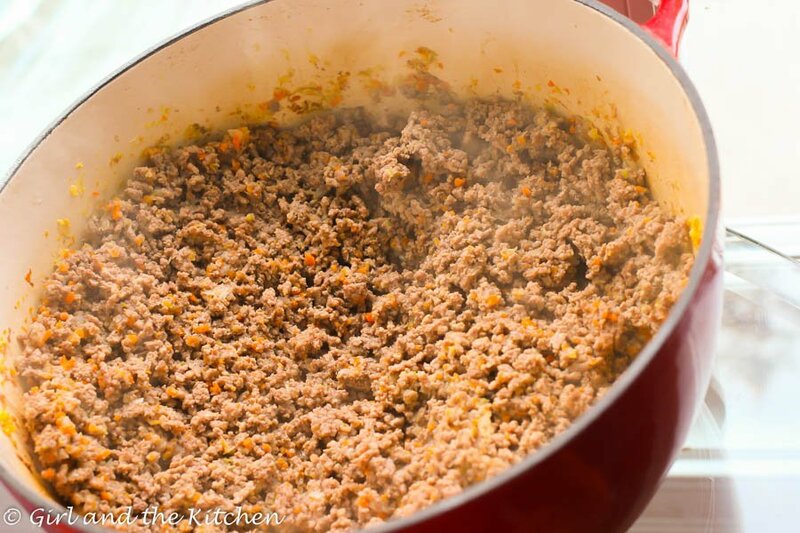 I used 95% lean ground beef so that I could keep it a bit healthier. 2. 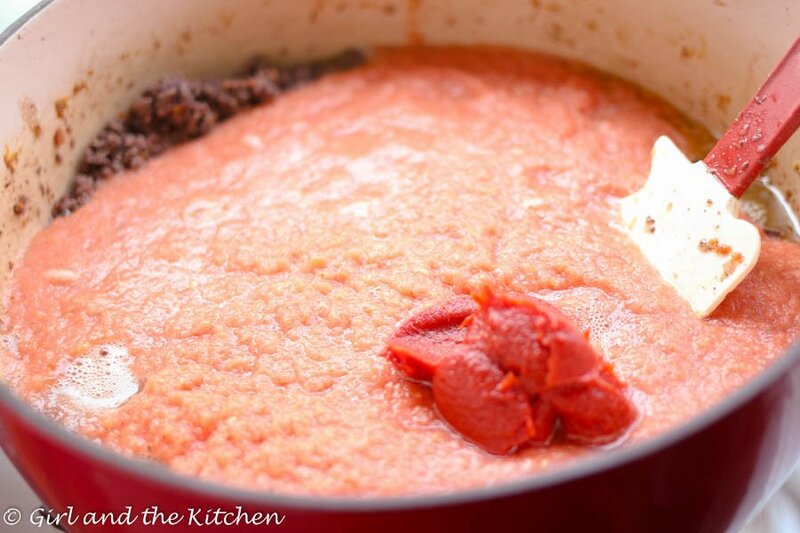 I used San Marizano tomato puree for the sauce because they are the sweetest of all the tomatoes. When I used the regular crushed tomatoes it was a bit too acidic for our taste. 4. 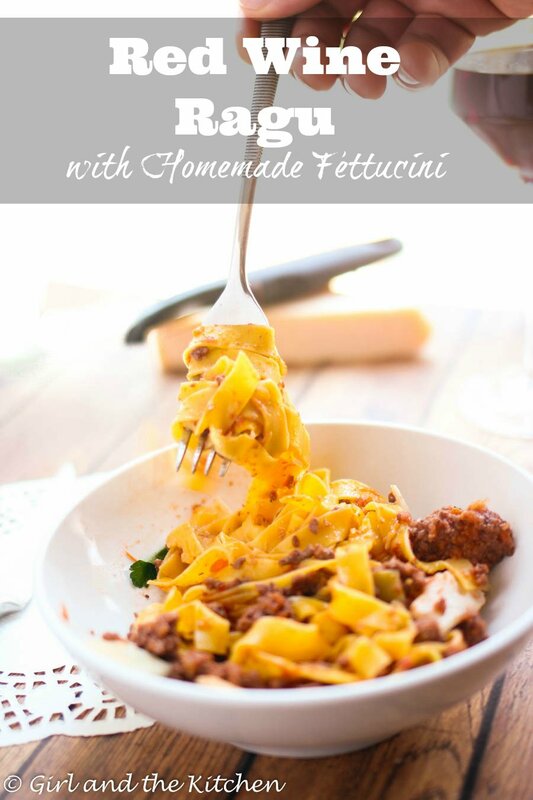 I made homemade fettuccine from my friend Dini’s site. They were fantastic and sooo easy! I actually made this days before and then just used it out of the fridge when I needed it! 5. I skipped the pancetta to make the dish a bit more lean. 6. I added in tomato paste to give it a bit more richness. 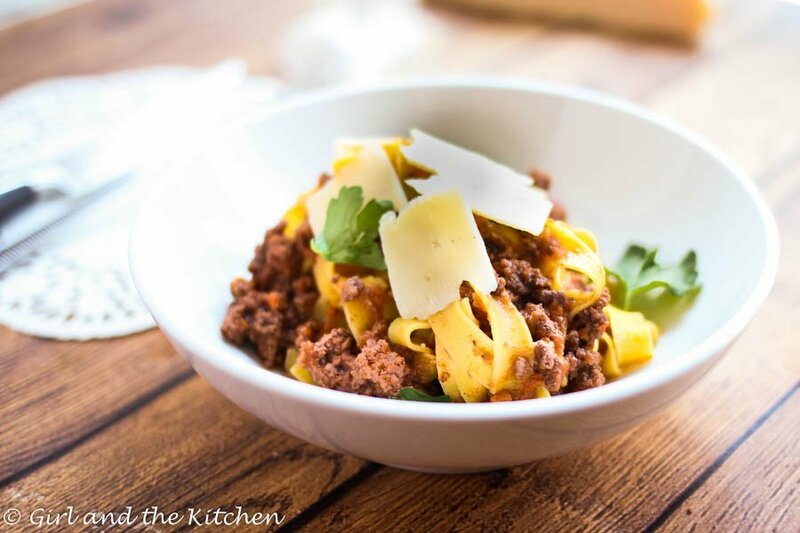 This recipe was super easy to follow but it does need a bit of time to cook through. 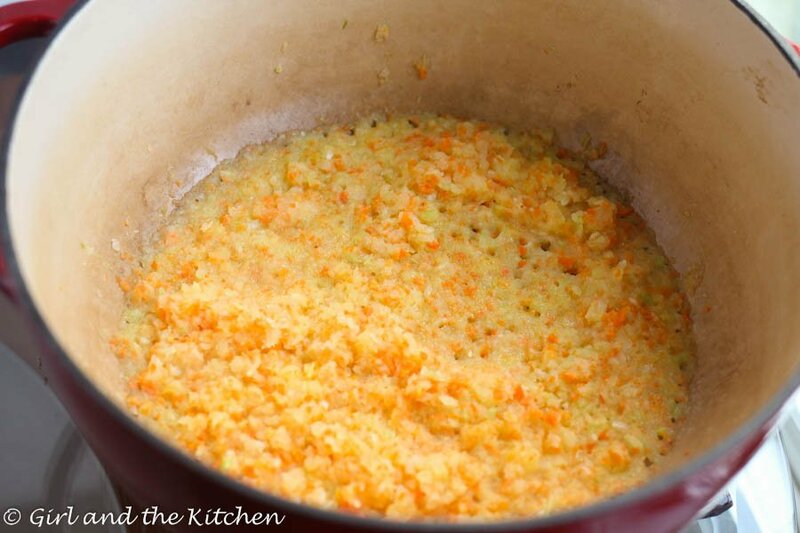 First you need to prep the veggies for the soffrito, which is the same as the French mirepoix. A mix of celery, onion and carrots. 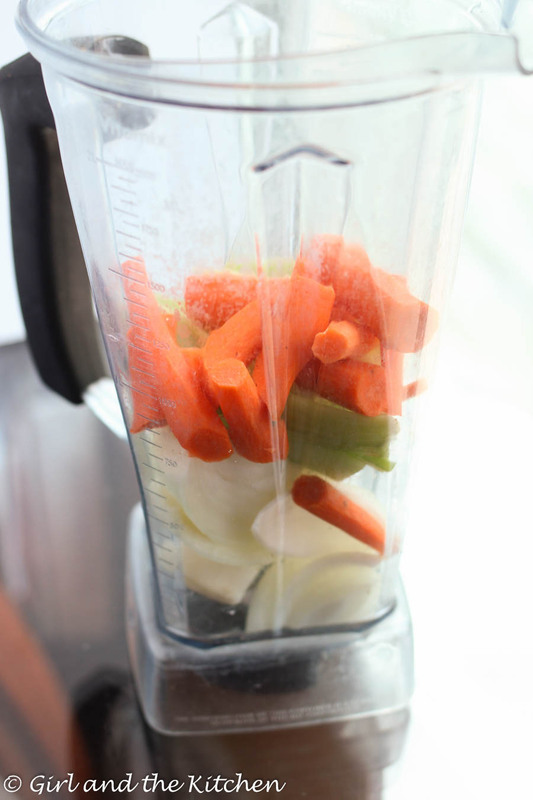 Because I prefer to do everything quickly, I just used the wet chop on my Vitamix and it was all chopped. I only cooked it for about 5 minutes until it was tender and translucent but did not have any color. 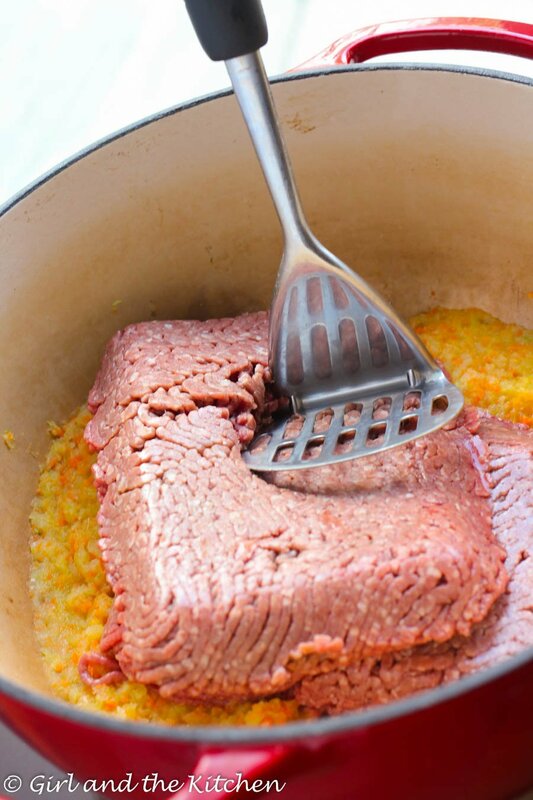 Once that step was done I added in the ground beef and I pressed it down with a potato smasher until it was all broken up. (You can also use a wooden spoon but I find the smasher the best method) Season with salt and black pepper. Once it was all broken up and nicely browned we were ready for the vino. At this point add in your tomatoes and tomato paste and stir everything up to combine. Just let this cook for about 30 minutes nice and slowly. Go ahead and start your SALTED pot of water for the pasta. 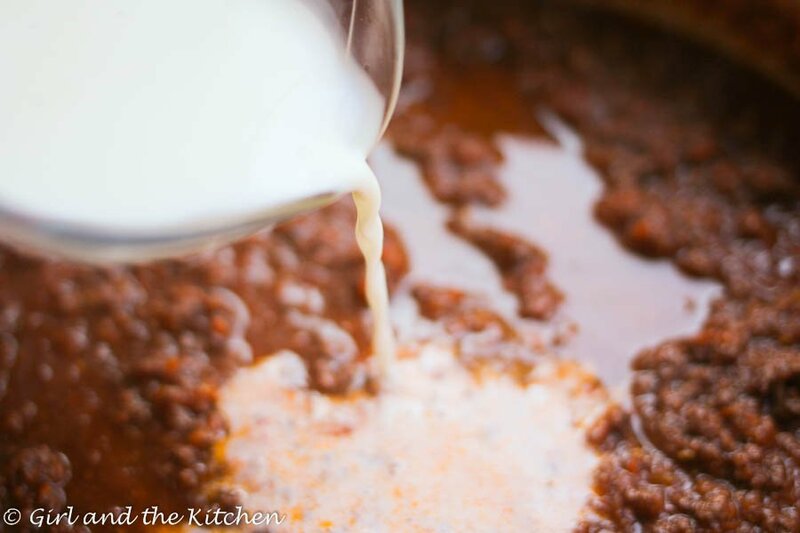 Turn off the heat and pour in your milk or cream. Give it a stir, taste for seasoning. If it is too acidic feel free to add in some sugar or honey to sweeten things up. 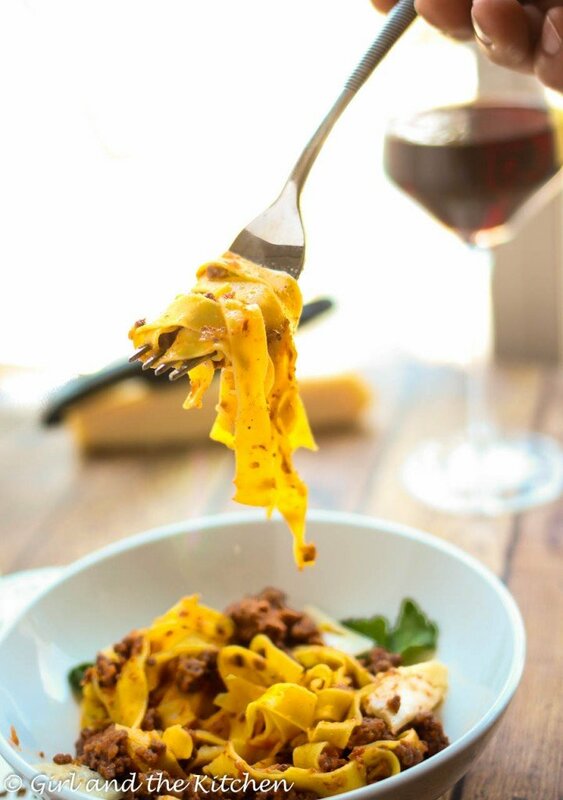 Cook up your pasta, slather in sauce and serve up with plenty of freshly grated Parm and crushed black pepper. 28-ounce can crushed San Marizano tomatoes. If you can only find the whole ones, just puree them up in a blender. Recipe adapted from Pinch and Swirl.